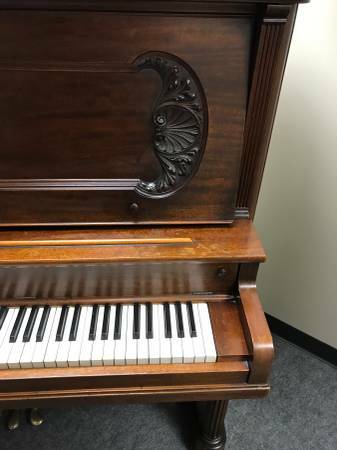 Vose & Sons Vintage Upright Piano, 1899- SOLD! 0ne of the better piano builders before the Great Depression, Vose and Sons used quality materials and expert Bostonian workmanship to build a piano that would last. This is one of those! The year of manufacture was 1899. It is a Style S, 4' 7" high, with a figured walnut cabinet. As with most all 100+ year old pianos, some work and maintenance is necessary to keep them in working order. That work has already been done on this piano! A new set of bass strings, new hammers, new bridal straps, action regulation, all together worth over $1000, make this piano a real deal. To top it off, this piano has original ivory key tops that are in excellent condition. They alone are worth way more than the cost of this piano. This is a piano that will work for you. Come in and play it!